As its very name implies, an adjustable kettlebell is a kettlebell that allows the user to adjust its weights during a workout. It is a multi-piece item that consists of a handle and various weights that are added or removed as needed. Swinging kettlebells around provides for an excellent workout that helps bring your heart rate up and burn fat. According to a study from the American Council on Exercise, kettebells can help you burn up to 20 calories per minute (Source). If you are looking to do kettlebell workouts at home or on the road, but at the same time you don’t want to buy entire sets of dumbbells, then adjustable kettlebells might be the best option for you. They are both portable and cost-effective. Below are our top five picks of adjustable kettlebells this summer. Our number one pick is rather unconventional. Yet, it sits at the top of our list precisely because of its unrivalled versatility, well-complemented by its safety and user-friendliness. 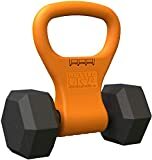 In fact, this thing isn’t a traditional kettlebell, but you can safely proceed with your purchase no matter what your current shape and stamina is. Although the listed weight range is from 0 to 45 pounds, it is completely dependent on what material you will decide to fill it with. Essentially, our top choice is an empty sandbag that is shaped and designed as a kettlebell. You can fill it with sand, as the instructions call for, or you can choose to fill it with pretty much anything, and filling it with different material will change the weight it can hold. For example, it can hold 45 pounds of dry sand, but wet sand is much heavier. Gravel, stones, dirt, mud – honestly, you can use just about anything you have lying around with this versatile bag of a kettlebell. The bag itself has a double wall and a separate liner, which gives it an incredible capacity. It’s made of ballistic nylon and it has a webbing that reinforces the sandbag to the mind-blowing 1,800 pounds. 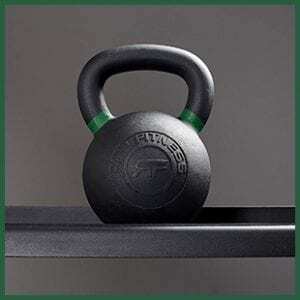 The rubber handle is contoured to resemble that of a standard kettlebell. Still, it may be a bit rough on your hands, especially if you have little or no experience in working out with weights. If this is the case, you may want to have a pair of gloves on while using it for the first time. The handle straps are triple reinforced with a box X-stitching. The straps that surround the bag are quadruple reinforced with an inner seam stitch. Its top seals with a spill proof HDPE stiffener, so you won’t need to worry about making a sand mess as you throw your weight around. 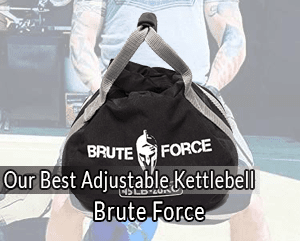 Brute Force have made a name for themselves for making super-durable sandbags, and when they brought the design over to a kettlebell, they pulled from a lot of quality experience and knowledge in its design. Brute Force sandbags are the original and most trusted workout sandbags on the market. The manufacturer provides 30-day Money Back Guarantee, backed by Brute Force’s Shield Warranty. The CFF adjustable kettlebell’s capacity ranges from 10 to 40 pounds and it’s got a 10-pound handle and base. The package includes six 5-pound plates, so you can build-up muscle at a natural and gradual pace. There is a locking device that is easily operated – simply pull back and twist to add and remove weights. This model allows you to change between workout types quickly. It has been scientifically proven that minimizing downtime in your workout keeps your heart rate and motivation high. And should you wonder where to begin, an instructional DVD is also included in the package. This kettlebell’s classic design features a traditional triangle type handle that is made of metal. With the weight adjustment option that the handle provides you’ll be effectively replacing seven different kettlebells with one, which will save you a lot of space and money. And because the handle is exactly the same for each weight you adjust it to, you’ll never have to adjust your grip as you increase the weight. The ten-pound-heavy handle of this kettle bell can be used for beginner workouts or exercises that require less weight. One recurring, although minor, complaint in the reviews of this product is the fact that after prolonged use screws do begin to loosen. Fortunately, they are easily tightened and, as long as you remain diligent in your attention to upkeep, this shouldn’t ever present an issue. Who says adjustable kettlebells are just for men? Our number three pick is designed for women. Empower’s 3-in-1 Kettlebell weight set is ergonomically designed for a woman’s grip while she is performing smooth, controlled workout. The handle itself is just five pounds and has two additional plates that will increase the weight to 8 and 12 pounds in total. When switching between weights, all you need do is click and twist to put on, push down on a latch button to unfasten it, and twist back off. Switching between weights (and therefore switching between workouts) couldn’t be any easier. This is a sand filled kettle bell with a soft touch plastic shell, so your palms won’t feel the pain of your workout nearly as much as with other weights. The grip itself is a classic triangle. The Click & twist patented design effortlessly adjusts from 5lb to 8lb to 12lb in seconds. Kettlebell workout is especially good for women, because it strengthens their muscles and relieves stress from the joints. if you’re not quite sure what you’re doing, it also comes with an instructional DVD and a workout guide. The penultimate spot on our list is for a product that features a relatively obvious design for an adjustable kettlebell. You simply take the base, or handle, and screw square plates onto the bottom. You will need to take a bit of time in between changes, but the change itself is utterly straight forward. The handle and base weigh 22.5 pounds in total, so this model isn’t very suitable for beginners. The handle and base are cast together to ensure maximum strength. Along with the base, you’ll get steel plates weighing 2.5 pounds each, and with these additions you’ll be able to get your kettlebell all the way to 57.5 pounds. The handle measures 1.375 inches in diameter, while the locking pin features machined steel threads. The entire design of this product has been through research and development so thoroughly, the manufacturer makes a point to advertise its ergonomic comfort. If you have other weight equipment by Ironmaster, you may already have some compatible plates at home. The plates themselves are interchangeable, so whether you want to use them on this kettlebell or purchase dumbbells, the plates will fit on the handle like a glove. Works with Ironmaster’s adjustable dumbbells. Our fifth pick isn’t exactly a standard kettlebell. Rather, it’s an adjustment you make to your dumbbells to create a kettlebell. You open the handle and place the dumbbell’s handle in the cradle, then close it, lock it and it will be secure enough for you to do all your kettlebell exercises. The cradle where your dumbbells rest is filled with a high-quality urethane foam that will prevent the weight from slipping. The Kettle Gryp will fit around any dumbbell handle 1.5 inches in diameter or less (and that is most). And it’s rated for any weight up to 55 pounds. It is just under one pound in weight, so the addition it makes to your weights is almost negligible, but you will want to take it into consideration if you’re just starting out and every pound matters. The grip itself is made of a high impact ABS plastic and the pin that hinges the grip is made of stainless steel. And should anything happen, the Kettle Gryp is backed with a lifetime warranty. If you already have a set of dumbbells and are just curious as to whether adding kettlebells into your routine may get the kind of results you’re looking for, this is an inexpensive way to find out. This is a perfect little addition to your already established weight room and it will expand your fitness purview and relieve any boredom you may be suffering during your workout. And not having to add all new equipment to your home gym will really help you save space. In fact, because of how portable it is, you can even pack it up and use it while you’re travelling; most gyms have dumbbells, but fewer have kettlebells. Adjustable kettlebells are best for those who have some experience working out with a kettlebell and are committing to doing kettlebell exercises long-term. Investing in an adjustable kettlebell is a great idea if you have discovered the many benefits of using a kettlebell as part of your workout routine. Pay close attention to the handle, as it is the most important part of an adjustable kettlebell. A good handle should be suitable for kettlebell workouts with one or both hands. It should feel sturdy and should not have a seam that would cause discomfort during a workout session. It is also important to check the handle weight. Some brands offer handles that weight as little as five lbs. while other companies sell adjustable kettlebell handles that may weight up to several lbs. consider what shape of kettlebell you want to use. Many adjustable kettlebells are round, which means they are the same shape as a fixed weight kettlebell. However, some adjustable kettlebells use square weights. No one type is necessarily better than the other, but you will need to try both types out to see which shape you feel most comfortable with. 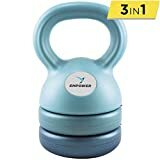 Some adjustable kettlebells are suitable only for a certain type of weights, while other can be filled up with just about any kind of material including water. 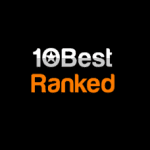 The latter type offers a wider variety of training options and workout modes. An adjustable kettlebell is a great thing to have for anyone who wants to use a kettlebell on a regular basis. It can be used in the same way as a fixed weight kettlebell, and there are many brand names and styles to pick from. While some adjustable kettlebells are undoubtedly better than others, in most cases, it is up to you to find the device that best suits your needs and budget. Consider your workout routine, personal goals and limitations and budget to determine which adjustable kettlebell is best for you. Thanks for reading our review and happy shopping!